› Author AffiliationsJ.K. and M.G. acknowledge financial support by the DFG Forschergruppe under grant number FOR2372. 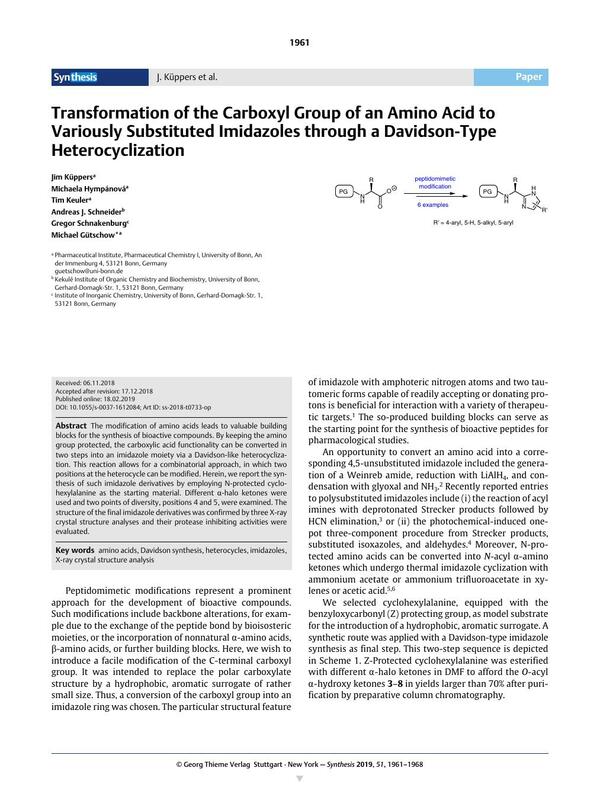 The modification of amino acids leads to valuable building blocks for the synthesis of bioactive compounds. By keeping the amino group protected, the carboxylic acid functionality can be converted in two steps into an imidazole moiety via a Davidson-like heterocyclization. This reaction allows for a combinatorial approach, in which two positions at the heterocycle can be modified. Herein, we report the synthesis of such imidazole derivatives by employing N-protected cyclohexylalanine as the starting material. Different α-halo ketones were used and two points of diversity, positions 4 and 5, were examined. The structure of the final imidazole derivatives was confirmed by three X-ray crystal structure analyses and their protease inhibiting activities were evaluated. Supporting information for this article is available online at https://doi.org/10.1055/s-0037-1612084. 17 The X-ray crystallographic data collections of 11, 13, and 14 were performed on a Bruker D8 Venture diffractometer (Photon I detector) at 100(2) K (11) and 150(2) K (13, 14). The diffracto­meter was equipped with a low-temperature device (Oxford Cryostream 800, Oxford Cryosystems) and used mirror optic monochromated Cu Kα radiation (λ = 1.54178 Å). Intensities were measured by fine-slicing ϕ- and ω-scans and corrected for background, polarization, and Lorentz effects. Semi-empirical absorption corrections were applied for all data sets by using Bruker’s SADABS program. The structures were solved by direct methods and refined anisotropically by the least-squares procedure implemented in the ShelX program system. The hydrogen atoms were included isotropically using the riding model on the bound carbon atoms. CCDC 1874893 (14), CCDC 1874894 (11), and CCDC 1883702 (13) contain the supplementary crystallographic data for this paper. The data can be obtained free of charge from The Cambridge Crystallographic Data Centre via www.ccdc.cam.ac.uk/getstructures. 22 The values in parentheses are related to the second independent molecule in the X-ray crystal structure of 14. 25 The values in parentheses are related to the second independent molecule in the X-ray crystal structure of 4′-amino-5′-cyano-3′-nitro-1,1′:2′,1′′-terphenyl.